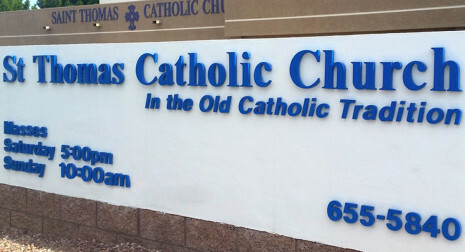 Welcome to Saint Thomas The Apostle Catholic Church, Las Vegas! It is our hope that you will find St. Thomas to be your worship home as you seek God's way for your life. We have a wide variety of opportunities for worship, service, education and community available for each of us to enjoy and to share our time and talents in the service of our brothers and sisters in Christ, Jesus the Lord. I feel confident that you will find in our parish the same gracious hospitality and sense of inclusion that so many of us new to St. Thomas have experienced in the past. Join us! You will feel welcomed at St. Thomas. Bishop Brian P. Spencer, M. Div. for directions to St. Thomas. At St. Thomas we have a special heart for Catholics who are no longer attending Mass, or who are searching because of past pains and impositions which have left them feeling separated, marginalized, abused, or scandalized but nevertheless still seeking a valid, authentic way to be Catholic and in God’s presence in today’s chaotic world. We want you to experience the fullness of the gospel message and its saving grace through Christ Jesus our Lord. We hold true to the teachings of the apostles and the historic Catholic Church, celebrating the fullness of a personal relationship with Christ Jesus through the sacraments which He initiated, and who gives great gifts of grace to all who receive His love, mercy and forgiveness by faith. We seek to live out the joy of our salvation in the kingdom of God in the fullness and power of the Holy Spirit, and be empowered to share that blessed hope with all who have no earthly hope. We seek to allow the Third Person of the Holy Trinity, the Holy Spirit, complete access to our lives so that He may continuously perform His sanctifying work in our lives, thereby molding our lives into the likeness of Christ Jesus until that day when our Lord returns again. As a community of believers, we serve one another and the broken world around us to the glory of God the Father. 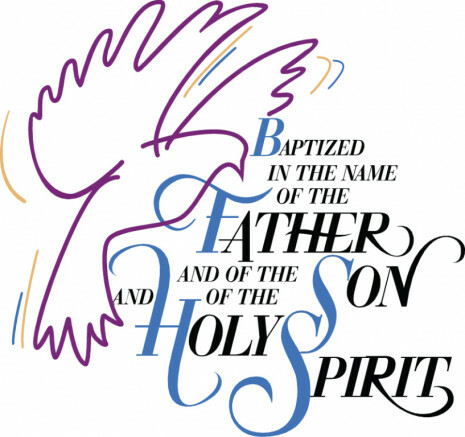 As Ecumenical Catholics we open our hearts and doors to all baptized Christians, to all believers in Christ Jesus that we might demonstrate Christ as the head of His Church and that we are all His body, thereby fulfilling Jesus own words, that we would give evidence that the Father had sent Him. 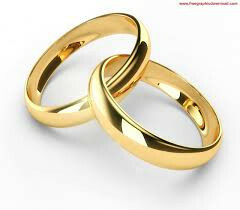 Our communion is open to all baptized Christians. Easter Sunday after the 10:00 am Mass. Easter Egg Round Up (Children's Easter Egg Hunt) Easter Sunday After The 10:00 Am Mass. 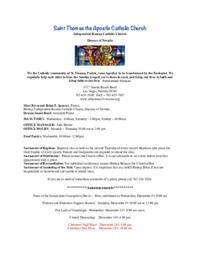 To make arrangements, contact the Parish Office at 702-655-5840 or email Bishop Brian at frbs71@yahoo.com. 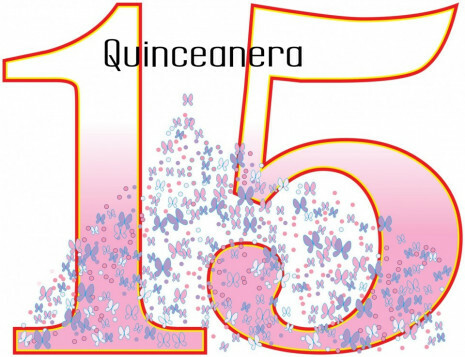 To visit our pages about Baptism Quinceanera and Marriage on this website click on the name above.